A visit to the Baccarat Hotel New York carves an impression of haute living and exhilarating engagements on the guests senses. From the bustling streets of Midtown Manhattan, the entrance may seem understated. But upon closer examination one realizes the new surroundings envelope your physical and mental state; and heighten your level of awareness. The subtle touches, such as the Baccarat lifestyle signature of a single colored crystal hanging from the chandeliers, let you know your new environment is for the most discerning. 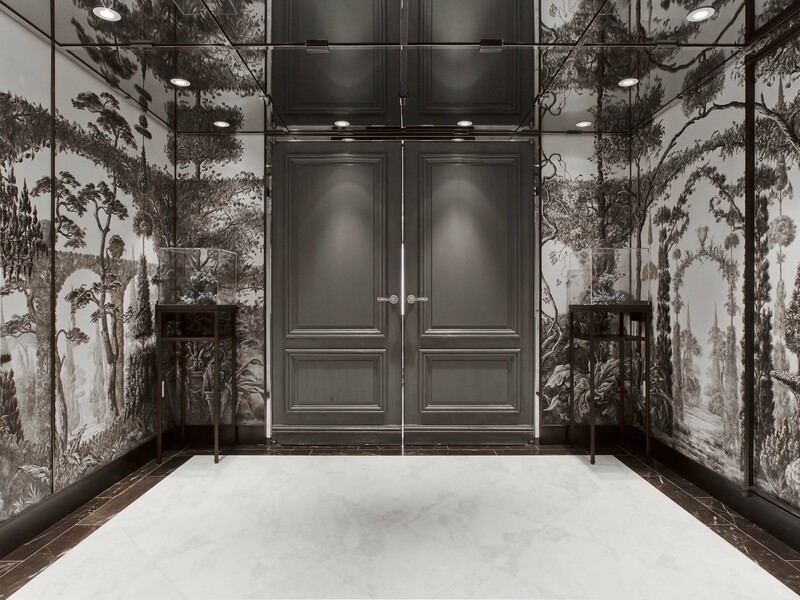 The ultimate celebration of the legendary crystal maison’s noble heritage of perfect craft, the one-bedroom Baccarat Suite embodies the absolute best of the brand’s artisanal essence and fanciful spirit. It expands across 1,740 square feet, offering splendidly sweeping spaces — all lit by crystal chandeliers and walls of windows — in which to entertain and relax. Like the suite of rooms exclusively reserved for the aristocratic owners of a posh Parisian hôtel particulier, the Baccarat Suite is a private, residential refuge of exceptional style and unparalleled sophistication. Steeped in a soft, subtle palette of champagne, ivory, platinum, stainless steel and chocolate brown, the suite’s series of salon-like spaces extends from a resplendent foyer into a living room whose invitingly soft seating encourages long conversations over glasses of Champagne. 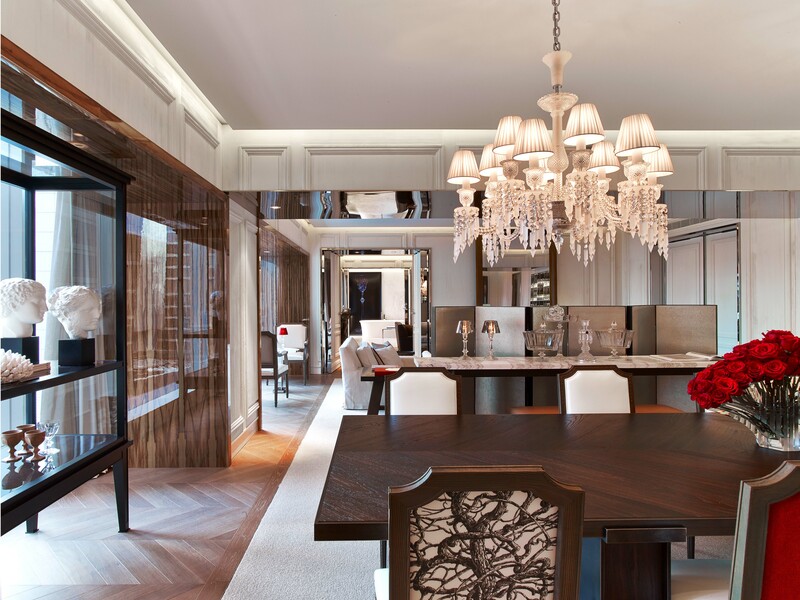 In the dining room, a butler’s pantry and separate staff entrance make for effortless entertaining — a feat further assisted by an in-suite Baccarat Bar, which stands at the ready offering fine wine chosen by the hotel’s expert sommelier as well as a full range of spirits (not to mention the Baccarat crystal barware to go with them). A separate powder room for visitors and a media room with ultramodern technology round out the spaces in the suite’s public sphere. And, then, in the master suite itself: Custom-made Mascioni jacquard linens and a cashmere throw top an oversized four-poster king bed, while the spa-like white-marble bathroom features a deep, free-standing soaking tub, glass-walled shower, Italian robes, and amenities by La Mer. Throughout, Baccarat crystal accessories abound, as do curated original artwork and archival drawings from the Baccarat collection and such subtle surprises as the delicious delights from Parisian gourmet shop Ladurée, which fill the Baccarat-red enamel minibar. Baccarat Suite guests will enjoy exclusive complimentary benefits during their stay, including in-suite coffee and tea each morning, flutes of Champagne upon request, beauty products from the hotel’s Spa de La Mer, evening by-appointment hair blowouts, packing and unpacking service and a flexible checkout time.